Nest Bedding has been around for a few years now, but they’ve recently come out with a few new mattresses to enter the direct-to-consumer market. A lot of companies have popped up recently trying to capitalize on the trend of selling mattresses directly to the customers instead of through traditional retail, but Nest Bedding is in it for the long haul. That’s why I decided to review their mattresses. I’ve turned down many companies that I suspect are just looking to make quick money rather than making the best mattresses. Nest Bedding has two chief lineups they sell directly to the consumer right now: the Alexander which is their luxury lineup (which I review here), and the Love Bed, which is their more “standard” mattress which is the subject of this review. Here I will look at many factors like construction of the mattress, how the mattress feels, how much it costs, and warranty and return policies. This part gets a little technical, so feel free to skip it. These are the layers as shown on Nest Bedding’s website. The Love Bed lineup has two versions: a firm and a medium. All three use a 6″ thick, 1.8 pound density poly foam support base (which is pretty standard.) The top layer is 1.5 inches of a soft quilted foam. The next layer is a type of foam called Energex. It’s designed to be a quicker response foam than regular memory foam. The Energex layer is 2 inches thick on the medium and 1 inch thick on the firm. The support layer is convoluted, which means it’s egg crate shaped. This allows the mattress to breathe better and also helps the mattress contour to your body as needed. 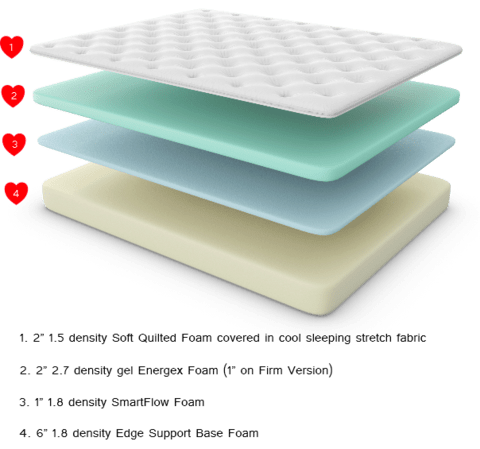 The poly foam used is CertiPUR-US certified and the mattresses are made in the USA, so you don’t need to worry about offgassing or quality assurance from China. If your eyes glazed over at the talk of foam densities and the like, the takeaway here is that the mattresses are solidly built. The difference between the three models is the quilting on the top and how hard the latex is under that. As we like to say in the mattress industry, “the feel is the deal,” so how do the three Love Bed models feel? Very heavy people who sleep on their back or stomach. (If you’re a very overweight side sleeper, consider getting something like this with a mattress topper on the top). Most people. If you’re anywhere from a few pounds overweight to average, especially if you’re a side or back sleeper (which are the most common positions), the Medium is the one to get. The Love Bed has a 100 night return policy, so you don’t have much to lose. This eliminates the downside of buying a mattress online. If it doesn’t work out for you, Nest makes it easy to return or exchange the mattress. There is no fee for the return, and they do NOT make you do the work to return it. They will find a local charity for you and donate the mattress. 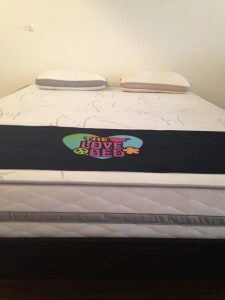 The Love Bed has a 10 year warranty which covers the mattress sagging more than an inch or any seams coming out. This 10 year warranty is the “industry standard” length. However, keep in mind that the warranty doesn’t necessarily reflect how long a mattress will be comfortable. The mattress will become less comfortable before it physically starts falling apart. I’d expect it to last about 7 or 8 years comfortably before you need to start looking for another mattress. The Love Bed is a very reasonable price. It retails at $799 in a queen size (and it’s $749 after using my coupon code, MATTRESSNERD50). The twin starts at $599 and the king goes up to $899 (again, before the coupon). It ships in a box free to your door. Nest Bedding doesn’t “play games” with their price, meaning you won’t find big sales; the Love Bed is priced fairly from the start. These prices are just for the mattress, so you’ll need your own platform bed, frame and boxspring, or adjustable base for the mattress. Since I tried these out in the showroom rather than having them deliver a bunch of mattresses to me, I didn’t experience this firsthand, but the CEO of Nest Bedding assures me that there is no odor of “offgassing” with his mattresses. Other reviewers who have had them sent to their houses have confirmed this, and I have no reason to doubt anybody on this. That’s a very bold claim for a CEO to make, and I’m comfortable repeating it here. With many other foam mattresses, you have to air them out after you open them, and the scent goes away after a few days. With the Love Bed, there’s little to no scent at all even right from opening the package. The Love Bed is a good option for a wide range of people. In general, if you have the money, I recommend getting the Alexander bed over the Love Bed, but the Love Bed makes a good “budget” version of the Alexander. It’s great for college students, guest rooms, young adults just starting out, and people that just can’t afford to spend over $1000 on a mattress. To buy the Love Bed, click here and select your firmness. Thank you for some other wonderful post. Where else may just anybody get that type of information in such a perfect approach of writing? I have a presentation subsequent week, and I'm on the look for such information. This is the perfect blog for anybody who wishes to understand this topic. You understand a whole lot its almost hard to argue with you (not that I really will need to…HaHa). You definitely put a brand new spin on a subject that has been discussed for decades. Great stuff, just excellent! They are all set to make money on the web over the various sites that offer newer games that will help you earn bucks within almost no time at all. Moreover, most of the people don't understand the running difference taking one path or perhaps the other method for their future. FX Friday continues to be developed to make Forex trading both profitable and simple. It looks like they might've. I don't see it on there either, but I haven't heard anything from the company about it, so I don't know. Hi do you know if they discontinued love bed soft? I dont see it on their site. Thanks! Those other review sites are wrong. I don't know how to say it any other way. I don't know which one specifically you were looking at, but a lot of them rate every mattress roughly the same, and try to put them all in about the same firmness (that most people want) to get more sales. I just report them the way I see them, and the Love Bed Firm is the right bed for very few people. The medium is still on the firmer side of the spectrum, but it will have a little bit of a plush feel. Hi again, Thanks for your response. I am confused by the varying reviews of the Love Bed firm. Based on what you describe that would definitely be too hard for our liking, but we are also worried that the medium will be too soft. Other review sites indicate that the firm love bed falls within the medium-firm rating at a 7-8 out if 10. If it's like a hard low-pile carpet that is too hard. Is the medium still firm enough that it won't feel like a push pillow top type feel? The Alexander Firm is a little softer, but it's also a few hundred dollars more. It would be roughly the same price as the Love Bed plus a nice topper. If you want to see the firmness of the Love Bed Firm, you don't really need to go into a store. If you have a carpeted floor in your house, that's roughly the same firmness. You're missing the fact that the Love Bed is not made by Bed in a Box. Bed in a Box is a different brand. Hey Mattress Nerd, Thanks to your diligence and research, I'm aiming for the Love Bed. They appear to charge $75 for a "disposal and pickup fee" for their Bed in a Box products (source: http://www.nestbedding.com/pages/delivery-and-returns). I thought there were no fees involved in returning a mattress -- what am I missing here? Thanks! Thanks for this. I think they changed it from 20 to 10. Either that or I completely misread something. In any case, it's been updated. Despite the 10 year warranty, it should last most of that length, since it uses latex and a strong HR foam base. The Love Bed Medium will be a bit softer than the Leesa, but they'll be similar in quality. So if you like things a little on the firmer side, go with the Leesa, if you like them a little on the softer side, get the Nest. For a back sleeper, firmer is often better, but this is not always the case (it varies by person), so it helps to go by what you've slept well on in the past. Based on your reviews, you seem to really like both the Nest Love Bed and the Leesa -- I'm trying to decide between the two. Do you like one of them better? I've recently had a lot of lower back pain and I'm fairly certain much of it has to do with my old mattress. I'm 6'0 and 220 lbs, I sleep mostly on my back, with some tossing and turning onto my side and stomach. From the research I've done, it seems like a Latex/Avena mattress is the way to go in terms of support and conformability. The Nest Alexander is out of my budget, so between the Love Bed Medium and the Leesa, what would you recommend?